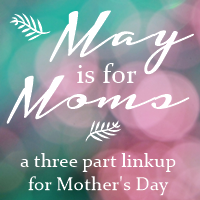 Following my own A Mom A Minute Series, I am now taking part in this May is for Moms series! Week one is all about me, and here are my answers to this week’s questions! 1. Before you ever even had children, how did you feel about being a mother? I can’t remember being the type of kid (like Gabbie) who imagined becoming a mom from an early age, but I do know that I always wanted kids and I wanted 3 or 4. I used to dream up baby names and had a running list. At one point I decided I wanted two boys and a girl but the girl should be in the middle. I also thought I would have twins. So I guess I always felt that I would become a mom one day! 2. Since becoming a mother, what is something that has happened that you never thought would? Almost everything that has happened to me since becoming a mom has been unexpected. Here are just a few of those things that I never expected: having trouble getting pregnant with my first, having 3 unplanned c-sections, becoming a breastfeeding fan and advocate, cloth diapering my 3rd (even just for a little while), potty training to be so hard, moving to Kansas, loving each one so differently and so much. 3. Is being a mother less difficult, more difficult or exactly how difficult you imagined? 4. What is your fondest memory of being a mother (so far)? There are so many memories I can thinnk of that all of a reason they shouldn’t be my favorite! One that keeps jumping out though is how proud I was of Gabbie at her pre-K graduation. Just seeing her up on the stage with all the other soon to be kindergartners made me want to cry. I don’t usually cry from happiness, so that moment stands out for me. 5. If your children only learn one life lesson from you, what do you hope it is? I hope they learn to believe in themselves, to love who they are, and to love the things they love without being afraid of what anyone else thinks. Next week I’ll be bringing you an interview with my mother and the following week will be an interview with Gabbie!